“Licia Albanese was, for her army of admirers, synonymous with the ‘old’ Met during the middle of the twentieth century. She made her début at the Met on 9 February, 1940, as Cio-Cio-San, and sang 427 performances of seventeen roles with the company. Her final Met appearance came at the farewell gala on the closing night of the old house, 16 April 1966, when she sang a thrilling performance of ‘Un bel dì’, dropped to her knees and softly kissed the stage that had been her home throughout the great and glorious years of her career. Many of those who attended remembered that the moment felt like the almost palpable passing of an era — which it was….it was not until she promised her father, on his deathbed, that she would forge a career that she moved to Milan and, with financial help from a cousin, studied with the great soprano Giuseppina Baldassarre-Tedeschi, who had been particularly identified with Madama Butterfly. The teacher instilled in her the importance of the meaning behind the words, the necessity of conveying emotion to the audience. An amazing fairy-tale-style succession of events occurred in 1934 and ’35. Albanese found out about a national vocal competition from a friend the very day the competition was closing and managed to get in at the eleventh hour. Believing Baldassare-Tedeschi would deem her not yet ready, she entered secretly. One of three hundred singers, Licia won the first round in Milan and traveled to Bologna for the finals, where she competed every day for a week before a tough panel of judges that included Rosetta Pampanini and Luisa Tetrazzini. Licia [won]first prize with the enormously difficult and dramatic ‘Un dì ero piccina’, from Mascagni’s IRIS. Back in Milan, in 1934, she attended a performance of BUTTERFLY at the Teatro Lirico and was pulled from the audience and [appeared] onstage to replace the soprano in the title role — singing it for the first time. Cio-Cio-San was also her ‘official’ début role before the notoriously demanding audience in Parma, in 1935. Her performance was a triumph, and the young singer found steady work in Italian theaters, singing everything from Wagner’s Elsa to Refice’s CECILIA, gaining invaluable experience. At one point, she found herself onstage with Beniamino Gigli, who so admired the soprano that he requested her for his 1938 recording of LA BOHÈME and recommended her to the Metropolitan Opera. She made débuts at La Scala (as Lauretta in GIANNI SCHICCHI), Rome and Geneva, and the 1937 Coronation Season in London featured her Liù in TURANDOT — her Covent Garden début, and a performance of which recorded fragments exist, displaying the trademark Albanese sound. In 1941, she made her débuts at San Francisco Opera, again as Cio-Cio-San, and Chicago Civic Opera, as Micaëla in CARMEN. Albanese was an ideal verismo artist of the time. She may not have possessed a sound as beautifully limpid as that of other Italian sopranos, but it was a voice of incomparable profile and cut — instantly recognizable to anyone who heard it even once. Always, she sang with full emotional commitment and stunning dramatic intensity; actor/comedian Charles Nelson Reilly, a lifelong Albanese admirer, once aptly observed that, if forced to, she might sacrifice the voice somewhat, but she never sacrificed the word. She invested her roles with enormous thought and preparation, no matter how many times she had sung them before. One of the challenges of Cio-Cio-San, she felt, was that the voice must be light in Act I, to underline the character’s youthful innocence, then gradually darken in the two successive acts, as the tragedy deepens. She took enormous pleasure in bringing certain plangent details to her characterizations — among them letting the wedding veil drop to the ground as Butterfly and Pinkerton enter their house at the close of Act I — ‘a little thing’, she told a reporter in 1947, ‘but effective’. She worked with another legendary perfectionist, Arturo Toscanini, who requested her for Mimì in the fiftieth-anniversary performance of LA BOHÈME. She loved working with him and was equally delighted when he asked her to sing the title role in LA TRAVIATA with the NBC Symphony Orchestra in 1946….Under Toscanini, Violetta — which she had already sung many times at the Met — became one of her immortal recorded performances. In Act IV’s ‘Addio del passato’, the snuffing out of life within Violetta is overwhelmingly moving. 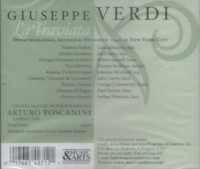 Albanese’s remains one of the most vivid, spontaneous and nakedly real Violettas on disc. Albanese had specific ideas about the nature of acting for the opera stage, feeling that it was a mistake to pursue absolute naturalism or to replicate acting techniques from the screen. ‘The stage is a world apart’, she once said, ‘and the opera stage something more specialized still…. You have to add poetry, too.’ She believed that Puccini’s roles were superbly crafted, but she always resisted the temptation to chew the scenery too much, underlining that Tosca was ‘a great diva in an era of poetic elegance’, not a common, hot-tempered shrew. Ultimately, she always believed in the innate dignity and aristocracy of Puccini’s heroines. She believed it was important to begin not with the notoriously tricky role of Manon Lescaut but with Mimì or Liù. ‘Butterfly’, she once said, ‘can break the voice’. She regretted never getting to sing Minnie in LA FANCIULLA DEL WEST, but she did sing her first Magda in LA RONDINE in 1960, in Philadelphia. She also expanded her repertoire carefully, adding roles such as Verdi’s Desdemona, Massenet’s Manon and Cilèa’s Adriana Lecouvreur. Explaining her remarkable longevity to OPERA NEWS’s editor Robert Jacobson in 1974, she said, ‘I never pushed on the low notes, except for some dramatic moments. I was taught to do it with accent and not with the voice. It is important to keep the middle voice light, even when dramatic, or you lose the high notes. The drama comes in accenting the words and with diction’. Albanese sang in a total of forty-one Met broadcasts; her broadcast record was Violetta, with ten separate airings. Her total of eighty-seven Violettas still stands as a Met record. She was busy in other areas as well: from 1942 to 1947, she had a weekly radio program, TREASURE HOUR OF SONG, in which she branched out to sing operetta and Broadway tunes. She had a happy private life, too, as the wife of stockbroker Joseph Gimma, who soon took on a major role in the handling of her career. They had a child, Joseph, Jr., born in 1952. She had enjoyed very happy relations with Met general manager Edward Johnson through the 1940s and successfully made the transition to the new regime of Rudolf Bing in 1950. She also appeared on television on THE ED SULLIVAN SHOW and VOICE OF FIRESTONE, as well as in the 1956 Warner Bros. musical drama SERENADE, starring Mario Lanza and Joan Fontaine. But by the 1960s, she was heard at the company far less often. (Albanese maintained that it was her determination to save the old Met on Thirty-ninth and Broadway, while the new building at Lincoln Center was in the works, that damaged her standing with Bing.) Although she never appeared at the New Met, which opened in 1966, she was frequently an enthusiastic — and voluble — member of the audience. At the opening of Giancarlo del Monaco’s new production of MADAMA BUTTERFLY in the mid-1990s, Albanese took exception to the director’s decision to have Pinkerton (Richard Leech) begin to disrobe Cio-Cio-San (Catherine Malfitano) onstage and erupted with a robust ‘BOO!’ from her orchestra seat. She was also much in evidence as the guiding spirit of the Licia Albanese–Puccini Foundation (an American counterpart to the established Italian organization), which she founded in 1974. For more than two decades, she presided over the Foundation’s concerts at Lincoln Center, handing out cash prizes to young singers, welcoming guest-star colleagues such as Fedora Barbieri, Leyla Gencer, Lucine Amara and Robert Merrill, and often performing herself; her opening-concert rendition of ‘The Star Spangled Banner’, complete with flag-waving gestures and a still-impressive B-flat, was always eagerly anticipated by the audience. "Indeed, the tenor's vocal solidity seems indestructible. Peerce, heard here in the fifth of his six impersonations of Riccardo, had sung the role in Toscanini's NBC Symphony concerts of January, 1954; though one does not look for variety of tone or graceful nuances with this tenor, his musical rectitude and dramatic continence are capital assets." "Jan Peerce was known as 'Toscanini's tenor', with his clean, incisive singing, exceptional breath support, and immediately distinctive timbre. After his New York song recital in 1964, Theodore Strongin wrote in The New York Times: 'He is a phenomenon, a master professional, a tenor of impeccable poise and control. His enunciation is completely clear, no matter what the language. His fortissimos fill the hall. His pianissimos, though remarkably soft, come through as clearly as many singers' fortissimos, so solid is the basic quality of his voice'. Mr. Peerce participated in Toscanini's broadcasts of LA BOHEME, LA TRAVIATA, FIDELIO, UN BALLO IN MASCHERA and the last act of RIGOLETTO. Many of these were released by Victor as commercial recordings. On 14 May, 1941, Mr. Peerce made his stage debut as the Duke in RIGOLETTO in Philadelphia. He made his Metropolitan Opera debut on 29 Nov., 1941, as Alfredo in LA TRAVIATA. In his Metropolitan Opera years, Mr. Peerce concentrated on the Italian repertory. From 1941 to 1968 at the Met, Mr. Peerce sang 205 performances in 11 operas, plus 119 performances on tour. His last complete stage performance at the Metropolitan Opera took place on 21 Feb, 1966, in DON GIOVANNI. On 16 April, 1966, he was one of the participants in the Metropolitan's farewell gala, the last performance in the old opera house. James Levine, who first heard Mr. Peerce in Cincinnati many years ago and later worked with him professionally, described Mr. Peerce as 'one of the most extraordinary singers and human beings I have ever known'. He paid tribute to the tenor's 'stylistic versatility, rhythmic & Ã©lan, communicative ability and wide repertory'. When he was not singing at the Metropolitan Opera, Mr. Peerce was giving concerts. He never could stand still. But the basic condition of his voice never changed, and he thrived on a schedule that would have killed most other singers. He also appeared in European opera houses, and in 1956 was the first American ever to sing at the Bolshoi Opera in Moscow since the war. His films included appearances in CARNEGIE HALL, TONIGHT WE SING and GOODBYE, COLUMBUS. He recorded for many companies. For many years Mr. Peerce was one of the steadiest, most reliable singers before the public. He attributed his vocal longevity to a secure technique." "Robert Merrill made his Metropolitan debut as Germont on 15 Dec., 1945, and celebrated his 500th performance there on 5 March, 1973. He remained on the Met roster until 1976. During his tenure with the Met, Mr. Merrill sang leading roles in much of the standard repertory, including the title role in RIGOLETTO, Germont in LA TRAVIATA, Figaro in IL BARBIERE DI SIVIGLIA, Escamillo in CARMEN and Tonio in PAGLIACCI; he appeared in most of these many times. 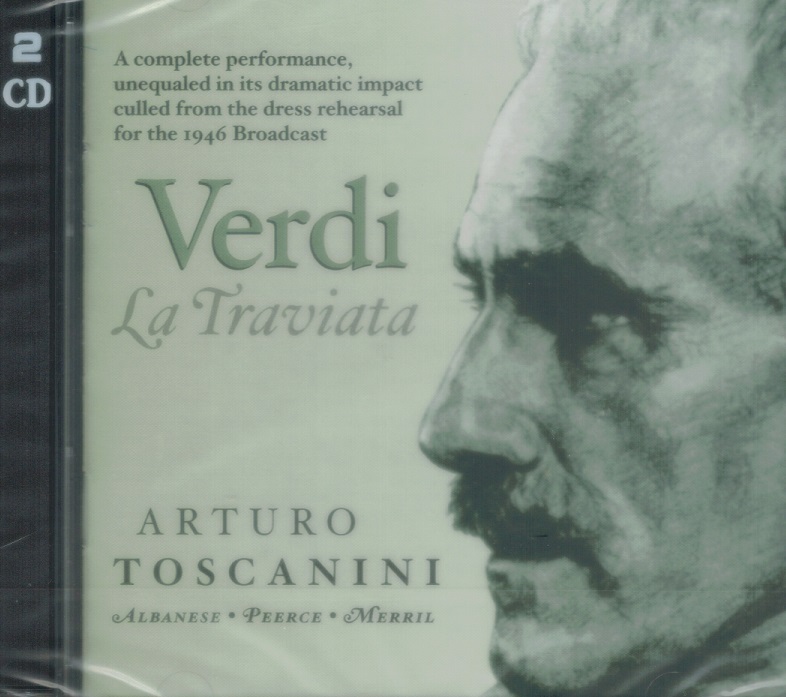 Regarded as one of the greatest Verdi baritones of his generation, he was known for the security and strength of his sound, as well as for the precision and clarity with which he could hit pitches across his two-octave range. Although he occasionally appeared in Europe and South America, he preferred to base his career at the Metropolitan Opera, where he sang all the major baritone roles of the Italian and French repertories, Peter G. Davis wrote of Mr. Merrill in THE NEW GROVE DICTIONARY OF AMERICAN MUSIC. ' In terms of vocal endowment, technical security and longevity, he was unequaled among baritones of his generation at the Metropolitan'. 'After Leonard Warren's tragic death onstage at the Metropolitan in 1960, Merrill became more or less indisputably America's principal baritone and perhaps the best lyricist since Giuseppe de Luca', the critic J. B. Steane wrote in his book THE GRAND TRADITION. The easy and even production of a beautifully well-rounded tone is not common, especially when the voice is also a powerful one; yet this is, after all, the basis of operatic singing, and Merrill's records will always commend themselves in these terms. Mr. Merrill made many recordings for RCA. 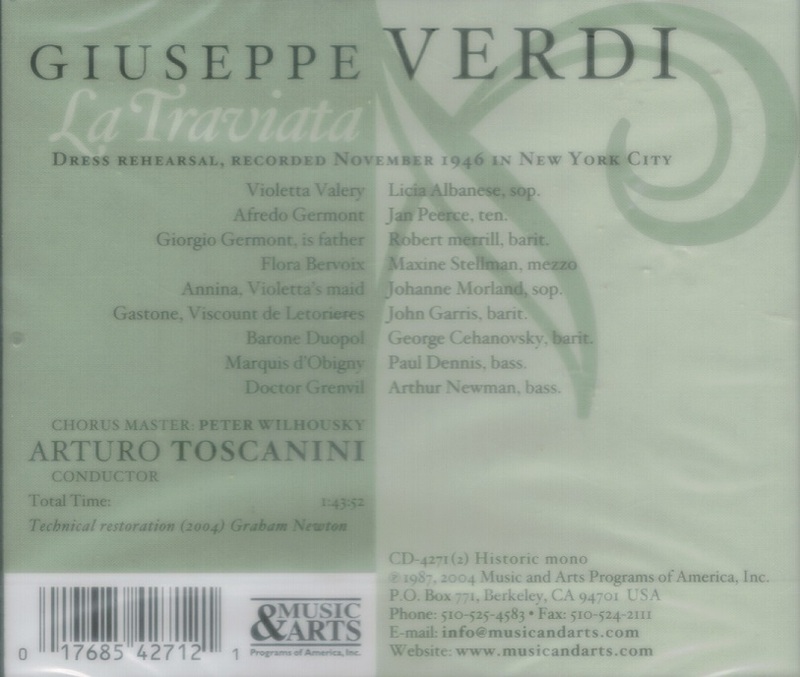 He sang in two complete opera broadcasts on radio under Toscanini - LA TRAVIATA in 1946 and UN BALLO IN MASCHERA in 1953 - both of which were later issued on CD. He wrote two autobiographies, ONCE MORE FROM THE BEGINNING (1965) and BETWEEN ACTS (1976), as well as a novel, THE DIVAS (1978). He received a number of honorary doctorates and awards."